Everyone gets a chuckle when the name Thomas Crapper pops up in a discussion of plumbing. While Crapper did have an impact on the world’s development of a flush-toilet, he did not, as is popularly suggested, invent the indoor water closet. Water Closet; the Loo; The Throne; W/C; Flush Toilet; Toilet; Crapper; whatever you call it, it’s an invaluable piece of your household plumbing. Most of us want it to work, and not think too much about how it works. NC Plumbing Services’ qualified plumbers can help you repair your existing toilet, maintain your fully-functioning toilet, or plan the next step in your toilet needs. If you have an older home, you’ll probably want to discuss what kind of water-saving toilets are available when you’re ready to upgrade. Our plumbers can discuss low gallon-per-flush (gpf) options for your bathroom, or your entire house, and talk about the various installation options to best fit your lifestyle. NC Plumbing Services provides complete plumbing services in in Raleigh, Durham, Chapel Hill, Wake Forest, Cary, Garner, Clayton, Apex, Fuquay-Varina, Holly Springs and beyond including the counties of Wake, Harnett, and Johnston. 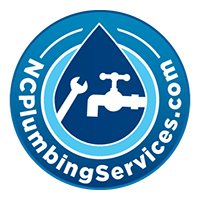 NC Plumbing Services provides complete plumbing services in Raleigh, Durham, Chapel Hill, Wake Forest, Cary, Garner, Clayton, Apex, Fuquay-Varina, Holly Springs and beyond including the counties of Wake, Harnett, and Johnston. At NCPlumbingServices.com our trusted team is available 24/7 to handle all your emergency plumbing and water heater needs. Call for reliable, respectful service at prices that won’t break your budget.